The HP LaserJet Enterprise 600 Series Printer is not only a monochrome printer, but quite the mouthful as well. 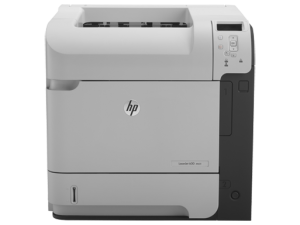 The M601n is a nice mid-size office printer which replaces the HP LaserJet P4515n. This upgrade offers a few bells and whistles that we find intriguing, not least of which is the ePrint feature. This printer is rather quiet, and prints in the range of 43-45 ppm, which we are quite happy with. The printer is styled rather nicely as well. All printers are designed to look unobtrusive, and to fit in nearly any office environment. Typically, after a few weeks, a printer reduces to an eyesore, and if you stop to pay attention to a printer, it’s because it’s messing up. This printer will be a little less offensive, in this sense, than some older models. But that’s just it, you don’t want to stop and look at a printer, you want to sit at your computer, tell it to print something, go grab it, and come back. You don’t want to change the paper, you don’t want to find an annoying beep and a paper jam, you want the printer to quickly give you your paper, and nothing else really. Well, it turns out that the M601n is more than just pretty, it’s been quite a good performer for our customers. In fact, there hasn’t been anything consistently wrong with it that we’ve seen; mostly just standard maintenance is all that it needs. Even better, with the ePrint feature, you can print from nearly any of your electronic devices (phone, desktop, laptop, tablet…) with an internet connection. With older printers, you might be able to manage something similar by sharing a printer through a desktop, but it’s tied to a desktop, and it’s tied to your home network. We have found one problem in the M601n product manual. The service PINs that must be entered to service the printer are wrong, and the technician must have access to the correct PIN in order to work or access information on some parts of the machine. However, that should not be a problem for any technician. This machine will only take the standard yield toner cartridge, but still has a good cost per page. It uses the CE309A toner cartridge, cost of $174.99, which has a yield of 10,000 pages at 5% coverage, which comes out to 0.0179 cents per page*. When using the Laser Technology aftermarket cartridge, $119.00, that cost comes down even further to 0.0119 cents per page*. All in all, this printer is another winner for HP LaserJet printers. We like the M601n. We found this printer to be easy to use, as well as very reliable. The inability to use a high-yield cartridge is a drawback, though. The ePrint feature can be really helpful, and might be a compelling reason to opt for a newer printer such as this one.